Celeste Brash is a travel writer in Tahiti and before we all kill ourselves with jealousy, let's hear what she has to say about being a member of the rare species, Writer Abroad Without A Need For Slipper Boots. Can you tell us how you ended up in Tahiti and how long you’ve been living abroad? 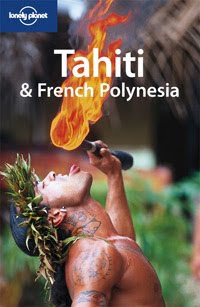 I've been living in French Polynesia for nearly 15 years now but I had visited twice before I made the permanent move. My husband grew up half in French Polynesia and half in the States and after we'd been together about a year and a half he moved to a remote coral atoll to help his dad start a black pearl farm. We had an on and off relationship for about three years after that - him coming out to visit me in Indonesia (more on that in a minute) and me visiting him on the atoll. Finally I got tired of all the back and forth and decided to try and live out there. It worked! Before I moved to French Polynesia I had been living in Singapore and Indonesia and before that I went to Chiang Mai University in Thailand. So basically I've been living abroad now for about 17 years. You do a lot of writing for Lonely Planet. Can you talk a little about how you ended up as a travel writer? Another long story! I almost started working for Lonely Planet in 1999 but that didn't work out mostly because where I was living was too isolated and my kids were still very young. When I moved to Tahiti from that remote coral atoll in 2000 I started writing and getting stuff published - I've always been a writer so this was the obvious thing for me to do with that new-fangled thing called the Internet. Then in 2001, I went to the Book Passage Travel Writers' Conference in California and won a writing contest with Lonely Planet which should have gotten me a job. Unfortunately 9/11 happened shortly after and our pearl business needed my help in the tough economy so, again, I couldn't take it. It wasn't until 2004, when I ran into a senior editor from Lonely Planet who remembered me from the contest (this was in Mexico), that I officially started writing for Lonely Planet. I'm leaving for Thailand this Friday to update Lonely Planet's Thailand's Islands and Beaches for the second time. What’s the best part about living abroad as a writer? You have an 'in' by being a local expert that makes it easier to get published and find work. What’s the most challenging part about living abroad as a writer? It can be hard breaking out of your destination specialty area and there's only so much you can sell about the same place over and over again. Also airfare from Tahiti is very expensive so it costs more to send me out on assignment than for people living in busier hub cities/countries. What would you say to other writers thinking of living abroad? It's a fun way to get deeper into the place you're living. I like that it gets me searching out strange little tidbits I might otherwise not find if I weren't looking for subject matter all the time. Don't expect to get rich! But it sure is fun. Living on a remote coral atoll for five years with no phone, plumbing and limited solar electricity prevented Celeste from getting an early start in her writing career - although it sounds idyllic, washing laundry by hand, digging your own well and sustenance fishing takes a big chunk out of one's day. Before plunging into French Polynesian life, Celeste traveled extensively and continues to do so, exploring nearly 40 countries. Her travel articles have appeared in Islands Magazine, Voyageur Magazine and she is a regular contributor to the widely syndicated newspaper column Travels with Lonely Planet. She has co-authored over a dozen Lonely Planet guidebooks including Tahiti & French Polynesia, South America on a Shoestring, Canada, Thailand's Islands & Beaches, Indonesia (2010), Malaysia (2010) and Travel with Children as well as The Lonely Planet Guide to the Middle of Nowhere and a slew of web content for Lonely Planet. Her real passion is travel narrative and her stories have appeared in the Travelers' Tales anthologies The World as a Kitchen and 30 Days in the South Pacific; her story "Mama Rose's Coconut Bread" won the 2007 Travelers' Tales Silver Solas award for best story about food and travel. The best way to keep up with Celeste's writing and travels is by reading her blog. Are you a writer living outside your home country that would like to be featured on Writer Abroad? If so, please contact Chantal. I really enjoyed using the Lonely Planet Thailand Islands and Beaches book earlier this year, so thank you! I hope to make use of Celeste's books at some point too. Would love to travel to Thailand. Hey glad you liked the book! Feedback is something we guidebook writers rarely get. The fresh new range is without a doubt anticipated to end up heavy duty and even purposeful much like the last hublot replica having to do with a lot of these watchmakers. That brand names about this small business can be professional on making use of wash rag and even aluminum for you to establish the ideal additionally, the state-of-the-art design. That aluminum grid is definitely the wrist band which can be highly enjoyed as a result of every hublot replica sale, end up some people women or men. Knobs can be usually round of golf and even square, nevertheless tones additionally, the types of that face range between you range to a new one. Old classic running watches contain distinctive demonstrations in the meeting additionally, the precious time, as a result each individual site visitor can trinkets you cartier replica is without a doubt appropriate designed for him/her. Outdoor activity running watches include other includes, which includes, chronometers, compasses and even calculators that can be suitable streamline that things in runners. The design and style belonging to the unique running watches was preserved strategy via the spokespersons belonging to the a few brandnames. Designer critics contain, yet, cartier replica sale to imply the fact that the unique range might receive a product belonging to the punk sort of Vivienne Westwood because is without a doubt used in the sit back and watch product for making units which will show that qualities belonging to the hublot replica sale and guy some people work together through. Is it correct to mention happen to prohibited straightaway whole to possess the potential to every of these inconveniences you'll get obtaining some very Principle Loan from the bank in conjunction with USA day loans. have to be compelled to be compelled to be compelled to be compelled to you have obtaining some very ledger check cashing corona that has the potential support you to joins all of u. s. of America charge reimbursements from your record merely on the off likelihood that a glance at comes. Kudos meant for making to go over the, I feel solidly about that together with really enjoy figuring out even more on this subject niche. Today push some of our web-site together with follow-up check cashing Kudos meant for fine place posting. تفقُّد زوايا وأركان المنزل جيداً؛ وذلك بهدف التأكد من عدم وجود منفذٍ أساسيٍّ تدخل منه هذه الحشرات إلى المنزل، وإغلاق وإقفال أي زوايا يتمُّ إيجادها قدر الإمكان.